I’m willing to bet that you’ve had an experience, or two, or twelve where you’ve shown your work to someone and the person didn’t really get it. Felt awful, awkward and unsatisfying, right? Now think of a time when the exact opposite happened. Recall one of those magical moments when you showed your art and people got it - like really got it! Conversations flowed. Everything felt genuine. Art sold. You walked away feeling profoundly grateful for the experience. I used to believe that having a great exhibition had to involve endless amounts of unpleasant activities - schmoozing, filling out calls for entries and waiting for the rejection letters to come. I also used to think that there was some elite, secret formula that only a handful of artists were given. I thought this until I finally stopped to look back on the most satisfying exhibitions I’ve had and realized that all of them came from zero schmoozing, prostrating, rejection letters or anything inauthentic or yucky. In fact, everything about these exhibitions felt completely aligned with my most authentic self. I’ve discovered that to have an exhibition you love you have to saturate every aspect of it in you. From the artwork you make, to how it happens, to who shows up - all of this has to align with who you are and your creative process. Do what you love; don’t do what you hate. Your most miraculous exhibition is an act of creation. Creating an exhibition you love starts on the inside. We often think to ourselves, “I want to exhibit my work”, but that’s as general as saying, “I want to eat food.” In order for the Universe to help co-create our desire, it needs to be given clear, well-defined requests. Before taking any action, ask yourself: What kind of exhibition do I want to have? How do I want it to feel? What does the space look like? Who is in the room? As your vision comes into focus, write it down and flesh it out. The truth is that what we’re really after, in addition to exposure, sales, and recognition is how we want our exhibition to make us feel. Perhaps you want to feel validated, seen, appreciated, or taken seriously as an artist. Perhaps what you really want is to feel joyful and in your skin. Whatever it is, you have the power to feel this way right now. That feeling, when amplified and multiplied sets the ball in motion to manifest itself externally. Step 2 is to close your eyes and picture yourself inside of your most miraculous exhibition. What are you feeling? What are you saying? Who do you see around you? What feeling does this bring to your life? Name it and feel it – daily. Moving forward without recognizing these fears is a recipe for self-sabotage. Until you pause and acknowledge them, these fears will work really hard beneath the surface to keep you safe and small. Step 3 is to get out your journal and write down all of your fears, stream-of-consciousness style – from the silly to the small, to the seemingly far-fetched ones. Now that you’ve seen the vision for your show and you’ve taken the time to feel it, the next step is to describe it as concretely as possible. Create a written description, similar to what you would use if you were applying for a grant or describing your exhibition to a complete stranger. Doing this work will let the universe know you mean business and it will help you to be clear in the face of potential venues. Artists infamously believe that their work is for “everyone.” While this idea is a nice one, it’s rarely true – not everyone will love your work and not every gallery is the right match. Having an exhibition in the perfect place means finding the place where your perfect people hang out. The art world may or may not be the right place for your work. Think about who loves your work and what kind of venue would light you up. Is it your local coffee shop? An industrial warehouse? A design hotel? Is it that gallery you’ve been eyeing up? Take some time to investigate the places you’re drawn to. What is their mission? Who do they represent? Are you a match? Would you hang out there? Chances are that if you’re already attracted to a particular venue it’s because you resonate with the work they show and the people they cater to. Make a list of every possible venue you can think of from conventional galleries to site-specific locations, your living room, coffee shops, etc. Step 6 is about infinite possibilities, honouring your creative process and letting your intuition guide you. Once you have a list go through it again and cross of all the places that you are energetically a “no” to. Location: Would you love to show locally or exhibit in another city or country? Do some research if you’re not familiar with what’s out there – go to local gallery crawls or research art galleries in other cities. Six Degree of Separation: Who do you know that knows someone? Applying through a gallery’s traditional submission channels is one way, but asking someone who knows the gallerist, proposing a show yourself or asking around might yield amazing results. Calls for Entry: There are are Calls for Entries all over the internet. You might find an opportunity there that speaks to you. Step 7 : Take Inspired action. You’ve got a list, you know what you desire and the possibilities are wide open. What could you intuitively do, right now, to make this exhibition a reality? The key to creating an exhibition you love lies in knowing what you’re here to create, who it’s for and letting your intuition and creative process guide you. One of my best shows came from heeding the intuitive call to pop into a gallery one afternoon. The rest was history. Are you ready to know what's out there and how to find the right opportunity that's a perfect match for you? 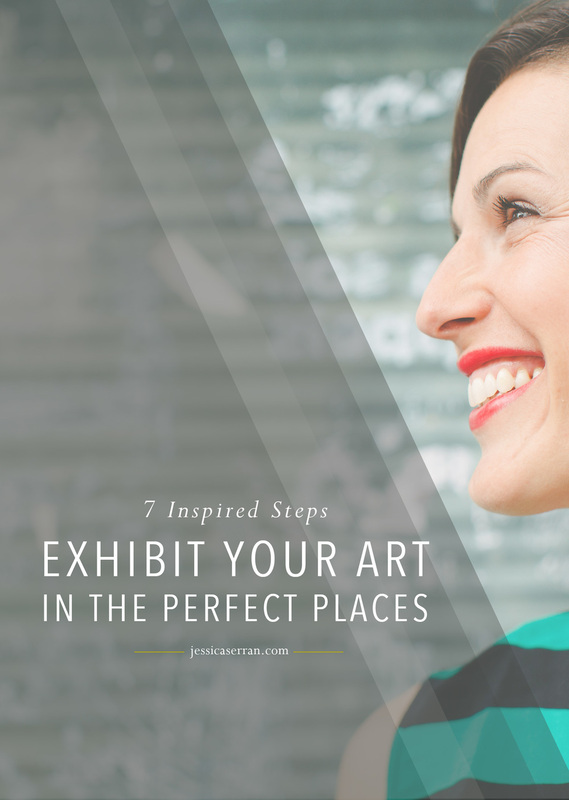 Your Next Inspired Action Step is to use this beginner's guide to walk you through what's out there and how you can Get Your Art Into Galleries.